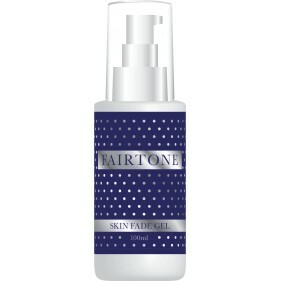 Fairtone Skin Fade Gel works quickly to fade away any problem blemishes and dark patches such as skin pigmentation, melasma, acne scars, skin discolouration and age spots among others. The unique formulation helps inhibit melanin production and gently lightens and tones the skins appearance. The non-greasy cooling gel is quickly absorbed into the skin, leaving your skin feeling revitalized and refreshed. The powerful formulation will brighten dullness and will ensure a fairer, glowing complexion. • Works quickly to fade away any problem blemishes and dark patches!• Fades skin pigmentation, melasma, acne scars & skin discolouration!• Helps inhibit melanin production and gently lightens & tones the skins!• Powerful formula will brighten dullness & ensure a fairer complexion! • Fairtone products are clinically proven to whiten your skin tone- fast!• Fairtone products are formulated using safe and natural ingredients!• Fairtone products are vigorously tested and guaranteed to give results!• Fairtone products are made in the UK, using high quality ingredients!